A lot of people looking to invest on their own are often scared off by all the financial jargons and the wild market swings. They believe that they are not cut out to invest on their own or investing is so complicated that it is better off left for the experts. Well, Investing is actually not rocket science and this book shows you how to do it painlessly. 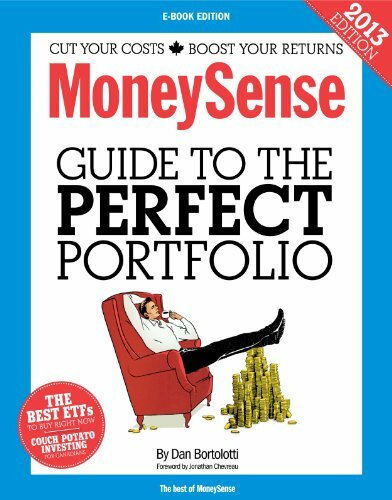 I, myself, have read the book and applied it for my own investments, and so far, I have made a decent returns This article is my review of the Moneysense: Guide to The Perfect Portfolio. The book’s strategy centres around creating a portfolio of Index Mutual Funds and Exchange Traded Funds (ETFs). This is also known as Index Investing or Passive Investing. The philosophy behind this investment strategy is not to try to beat the market but to mimic market returns. The way to mimic market returns is to create a portfolio that is split between bonds and stocks. The asset mix (deciding between how much of your portfolio to be in stocks or bonds) is very important. Investors wanting to take on more risk will prefer to have more equity and investors wanting more safety would do well to hold more bonds. Once a certain risk level is determined, seven important sectors are can be chosen. They are: Canadian Equity, Canadian Bonds, US Equity, International Equity, Emerging Markets Equity, and Real Estate Equity. Each of these sectors either represent a distinct type of investment (bonds, or stocks), companies that belong to a specific country (US stocks, international stocks), or hard assets (real estate). Again, investors wanting to be more conservative would choose to invest in more Canadian Bonds than other equities. The belief is that by investing in these seven sectors, investors can create a portfolio that comprises of the entire market. To buy these sectors, they are sold as mutual fund indexes and ETFs. The book starts off by providing a brief glimpse into the world of investing and why ETFs are a suitable investment. It provides historic returns to explain how trying to beat the market by actively picking stocks is a loser’s game in the long run. The reason is because we often let our emotions cloud our judgement. As the saying goes, we buy high and sell low. The book also spends a good chapter on understanding yourself. It poses questions such as what is your risk profile, how much risk are you truly comfortable with? The stock market fluctuates daily and based on the several years left until retirement, it doesn’t recommened taking on too much equity. Another big message the book tries to communicate is the need to keep things simple. Investors do not need elaborate investment strategies to make money. Hedge funds specialize in executing technical strategies that promises to earn superior returns than everyone else. This book recommends the exact opposite: forget the complex investments, let’s just invest into plain vanilla (just ordinary), diversified, and low cost funds. Low cost fees is also another highlight the book emphasizes on. All the funds the book recommends have management fees that are below 0.5%. Some mutual funds charge 2.5% and hedge funds can charge even more than that. The book makes an argument for low cost funds because as the years go on, investors can earn a lot without having the earnings be eroded by high fees. Once a portfolio is chosen from the book’s list, a section is dedicated to teaching people how to open a brokerage account to trade online. Annual maintenance of the portfolio and rebalancing of the funds is also taught. The purpose of rebalancing is different funds in the portfolio will go up and down in value. To make sure that the portfolio is not skewed to any particular fund, rebalancing is necessary at least once a year. Dan Bortolotti has a lot of knowledge when it comes to investing. He has written about personal finance for years with columns in Financial Post, Moneysense, and Canadian Moneysaver. He also maintains a blog where he champions Passive Investing. If all that wasn't enough, He has also won an award from the CFA (Certified Financial Analysts) Society. What I like about this book is that it is really a complete guide. Other investment books are very theory based and that makes it difficult to follow. This book was written with the novice investor in mind. There are a few things about this book though. The book is a simple read but it does take time to set up the funds. It will take even longer if you have not opened your own trading account yet. Once the trading account is set up and the portfolio is up and running, the difficult part is over. For me personally, my whole RRSP was modeled after this book. I chose this investment approach because of my long time horizon and I didn't want to pay large fees. I know that I can wait out any short-term market fluctuations and I like the idea that this portfolio is about passively investing. I don't need to care about how the market is doing, I just rebalance and monitor my performance. In the long run, I know I will come out ahead. When I purchased this book as a hard copy, it was about $12 (tax included). At the time I had already thought it was a steal. It now sells for $5 online, ebook version only. If you are an active investor who wants to day trade or look at the stock market everyday then this book isn’t for you. This strategy is meant for people who are in it for the long haul and is willing to wait out market fluctuations. If you are able to hold your investments for at least 6 years or more (the longer, the better your returns) then this book is for you.